I thought it would be interesting to run a blog post comparing different ways to present information on local businesses in Canada. Most local business sites present information in a standardized way, so the following examples will give you an idea of what some of the most common players in Canada are doing. By the way – there are many small regional players in the local space, however, for this particular post I wanted to focus on sites that the majority of Canadians who recognize. Lastly I had to reduce the images to fit within my blog post – so for a real comparison, please click on the images to load the full page. 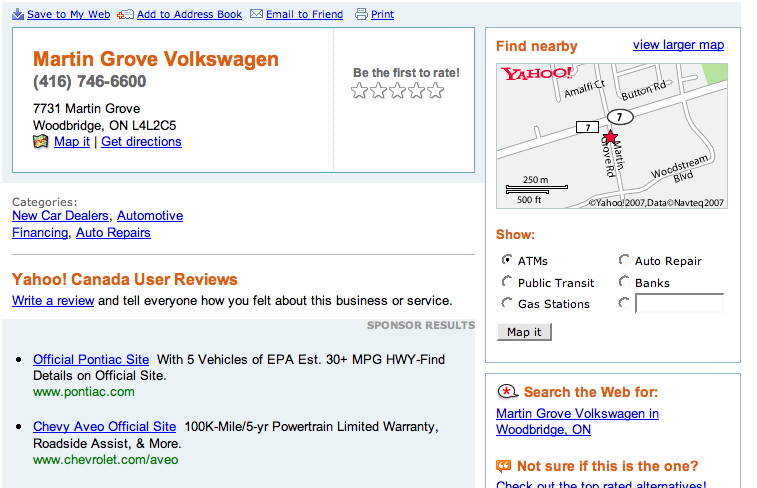 YellowPages.ca has recently launched a new look merchant page – see screenshot below from Martin Grove Volkswagen in Toronto. This entry was posted in Directory and Yellow Pages Advertising, Google Maps, Local, Yahoo Local, YellowPages.ca on December 17, 2007 by Darby Sieben.